Want to make the toughest job you will ever have a little bit easier? Try these 50 top parenting hacks to help you solve the common problems of parenting with a little creative thinking. If you have a child who insists she can do things “all by myself!” then here are some tips to help you avoid arguments, messes and mini-disasters while raising independent children. Saving Soap - Twist a rubber band around soap and shampoo dispenser pumps. This will limit the amount of product that your children can get per pump, and still allow them to wash up independently. Since your children won’t be using as much soap and shampoo, you will save money with this tip too! Right Foot - For the child who can put on his own shoes but has about a 50/50 chance of getting them on the correct foot, cut a sticker in half and put each half inside their shoes. When the two sticker halves line up correctly, the shoes will go on the correct foot. Condiment Catchall - Picnics are fun, but beware of the ketchup explosion when your independent child adds his own condiments to the hotdogs and hamburgers. Using muffin tins as a condiment container allows children to get just the right amount of ketchup or mustard and still do it themselves. Call Me - Create a bracelet out of number beads to help your child learn your phone number. During the learning process she can also wear the bracelet when you are out and about and will be able to contact you if she gets lost. Dress up - Make days of the week tags to slip over your child’s clothes hangers. That way, she can plan her outfits for the week on Sunday evening with your approval, which will allow her to dress herself independently — but still appropriately — for school. 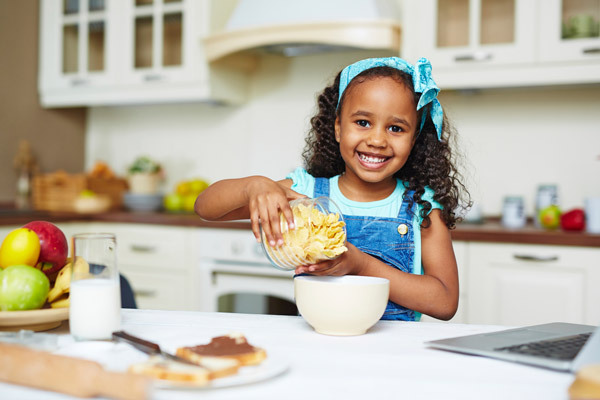 Healthy Start- Set up a breakfast station with single servings of cereal in plastic containers, and transfer milk into an easy pour container so that your little ones can make their own breakfast on the weekends. On the Potty - For the newly potty trained child who wants to “go” independently, make a sign that reads “that’s enough!” and put it on the wall below the toilet dispenser. This will keep your child from using a mile of toilet paper in a single use, and save you from calling a plumber to unclog your toilet. Slick Shoes - When your little girl wants to wear slick bottom dress-up shoes to look all grown up, use a glue gun to add a couple of glue dots to the bottom of the shoes. This will help her avoid slipping and falling and help you avoid arguments about what to wear. Water Fight - Water balloons are a fun part of childhood! Repurpose larger soap or shampoo pump dispensers to create water balloon pumps so that little hands can fill their own balloons. Collect RSVPs for a birthday party with an online sign up! SAMPLE. Keeping your kids entertained will help everyone get through the day! Here are some fun ideas to keep the little ones occupied. DIY Tap Shoes - Make your children their own tap dancing shoes by gluing pennies on to the bottom of a regular pair of shoes. They will enjoy an afternoon of dancing! Baking Sheet Magnet Board - Use a baking sheet as a magnet board and let your child create scenes with magnets. Add some letter magnets to make this activity both entertaining and educational! Bath Time - Keep your baby entertained during bath time by setting him and his favorite bath toys in a plastic laundry basket in the tub. All the toys will stay within reach and keep baby entertained. Indoor Pool - An inflatable pool sans water makes for a fun place to play, indoors or out. Add soft plastic balls for an indoor ball pit. Genius Tip: Organize monthly play dates for the neighborhood children. Use SignUpGenius for easy planning. Outdoor Playpen - Top a playpen with a fitted sheet so baby won’t get mosquito bites during outdoors playtime. Stroller Time - Keep baby entertained during a walk by pinning a ribbon to the stroller hood. Hang his favorite toy from the ribbon so that it stays within reach for the entire walk. You will both enjoy the walk it is not interrupted with stops to pick up dropped toys! Marker Refresh – Did your kid leave the markers out without a cap on for too long? Soak the markers in water, and you’ll get DIY watercolor paint for their next art project. Repurposed Sheets - You might not think of old bed sheets as entertaining, but your kids will! A sheet can be a large canvas for a painted mural — or a vital material in fort building. Children seem to leave a chocolate and spaghetti sauce trail wherever they go, so here are some tips for cleaning messes, minimizing messes and avoiding messes altogether! Dishwash Hero - Action figures and other plastic toys are great for indoor and outdoor play, but they get dirty and germy. Throw these items right into the dishwasher for easy cleaning and keep them in a “dirty toy bucket” for easy sorting. You could also try placing them in a mesh bag and tossing it into the washer and drying in the sun. Wall Grafitti – Did your little artist get carried away and start scribbling on the walls? Try denatured alcohol to clean up the mess and remove crayon and marker stains. Clip it - Time to cut your child’s toenails? Use tape to pick up the clippings off the floor for easy cleanup. Glitter Bomb - Use a lint roller to clean up this irritating mess after a craft project involving glitter or a snack involving sprinkles. Ziploc Art - When your little artist wants to paint, put some paint into a plastic bag, seal it and tape it to a wall or low window. Your child will have squishing the paint around and watching the colors swirl and blend, and there is no mess. Cleanest art project ever! Genius Tip: Make this activity educational by helping kids trace letters and numbers in the paint. Messy Shotgun - If gunk and grime have found permanent homes in your car’s cup holders thanks to messy kids, line them with silicone cupcake liners. Simply remove and throw away when the mess builds up. Ice Bath - Do you dread giving your messy eater an ice cream cone? Let him eat this disaster-dessert right in the bathtub for easy cleanup. Sip ‘n Clean - Sippy cups are a necessity for young children, but the sippers get clogged and can be difficult to clean. Use a Q-Tip or small baby bottle brush to get the gunk out of the sippy spout. Sand Shake Off - Children love to go to the beach, but sand makes a mess of your car and your home. Use baby powder to remove damp sand on your children’s feet before they get into the car, and keep the sand at the beach where it belongs. This also goes for sandbox sessions at the park. 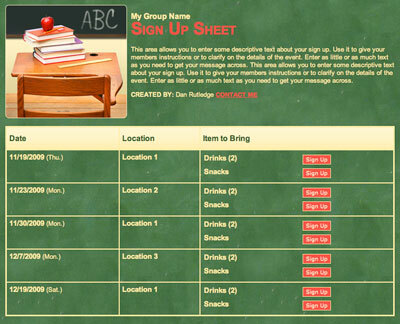 Organize game day snacks with an online sign up! SAMPLE. Popsicle Problem - Put a cupcake liner or a coffee cup lid turned upside down at the base of Popsicles to catch the drippings. Another Popsicle tip — when you make homemade popsicles, adding a gelatin to the mix will make them less drippy. Sticker Situation – Cursing yourself for forgetting to take off the stickers from your kid’s clothes before they went in the wash? Apply Goo Gone or dish soap to the sticky residue to rub it out and then put it in the wash cycle again. Repeat if necessary. Summer Fun - Children love to play in the pool and sprinkler during the warm weather, but it seems to create a mountain of laundry for parents. Build an outdoor drying rack using PVC pipe for wet towels and clothes so that the towels will dry, and be readily available for additional use. Genius Tip: Planning a pool party? 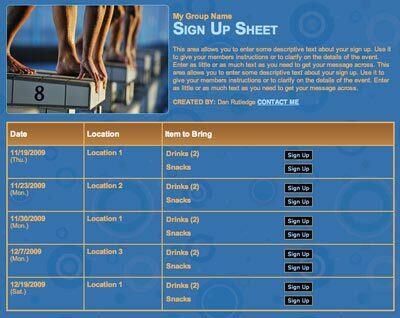 Use SignUpGenius to collect RSVPS! Touch Pad Trouble – Have your child’s messy fingers left smudge marks all over your mobile phone or iPad? Grab some leftover felt from a craft project to wipe away the mess. Bad Hair Day - Her favorite doll’s hair is out of control! Make doll hairspray by adding 2 tablespoons of fabric softener to water and put an end to dolly’s bad hair day. Cleaning Strike – Is your child dragging his feet to clean his room? Don’t trudge up and down the stairs repeatedly. Have your child text you a photo of the clean room so you don’t have to stop what you are doing to check the progress. Laundry Shuffle - Use the dot method to keep track of who that laundry belongs to. Code your clothing tags for laundry identification — one dot for firstborn, two for the second child, etc. This works better than putting their names on the tags if you like to pass the clothes down as they are outgrown. Whether you are driving 20 minutes to the soccer field or headed out on an extended vacation, traveling with children can be a challenge! Here are a few tricks to help everyone enjoy the ride. To Go - A plastic shower caddy makes a great food tray when your children need to eat meals in the car. If you’re on a long trip and know your kids will be munching away, cover your seats with fitted sheets for easy cleaning later. Productive Packing - When you are packing for a vacation, keep your kid’s suitcase organized with Ziploc bags. Pack a day’s worth of clothing in each bag. At the end of the day, dirty clothes can go back in the bag and won’t contaminate the clean clothes. Within Reach - A shoe caddy slung over the back of the driver seat will keep toys, water bottles or snacks within arms length during a car trip. Sipping Spills – Head off water or juice spills in the car by poking a hole in the top of a disposable water bottle lid and slipping a straw through the crack. Great for kids who have graduated past sippy cups. Small-size Fun - Make a “busy wallet” with your old wallet for your traveling child. Fill the wallet with a pen and credit card sized papers to keep her entertained during short trips. Spelling Study - Take a photo of the spelling list or test questions with your phone so that your school aged child can use travel time as extra study time. Hanging Around – Hang a tension rod in your trunk for clothing items you don’t want to wrinkle. This is particularly useful if your child needs to make a change later in the day — say for dance rehearsal — and you don’t want their outfit to look tousled. 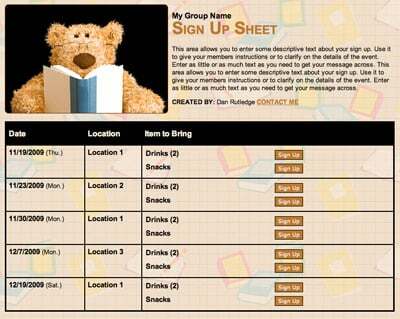 Plan a carpool for your kids with an online sign up! SAMPLE. From babies to teens, here are some handy parenting problem solvers that will make your life easier! Sippy in Sight – Tired of cleaning so many cups every day when all your kid wants is water? Add magnets and monograms to some plastic cups, and keep them right on the outside of the fridge for multiple uses on hot and thirsty days. Veggie Sprinkles – We’ve all known a picky eater who won’t eat healthy foods. Try adding sprinkles. Adding sprinkles to broccoli or a smoothie will make it look more appealing, so the choosy eater will try healthier foods. Shoe Shopping – Shoe shopping is not a fun task when you have to bring your child to multiple stores and try on shoes until you find just the right size for the right price. Instead of dragging them around town, trace your child’s feet, hire a sitter and do this task by yourself! Bite-size Bites - Cutting up baby’s food into tiny bite-size pieces getting to you? Use a pizza cutter or kitchen shears to make the job faster and easier. Teething Troubles - Freeze a pacifier in an ice cube tray with juice, formula or water to sooth the gums when you’re baby is going through the inevitable teething phase. Sunburn Relief – Freeze aloe vera in an ice cube tray for instant sunburn relief when you forget to reapply sunscreen during a long pool or beach session. Hungry Mouths – If your home has become the de-facto hangout spot in the neighborhood, keep some frozen Capri Suns around for a fun, easy and economical outdoor slushy snack. Splinter Solution – Ouch! Soothe your hurt child by applying a paste made from baking soda and water. After a few minutes, the baking soda will draw the splinter out without painful tweezing. Wet the Bed – Defend against the midnight bed wetter by placing a double layer of waterproof bed sheets on the mattress during potty training. When an accident occurs, you just need to remove the top layer for a clean, dry sheet. Everyone gets back to sleep quickly, and you can deal with the dirty laundry in the morning! Screen Zombie – Too much screen time results in that glazed look on your child’s face. Set a daily WiFi password, and make your children earn access to the password by completing a list of chores. Do you have a genius parenting hack? Share it here in the comments! Our readers love learning new tips to make parenting less work and more fun. 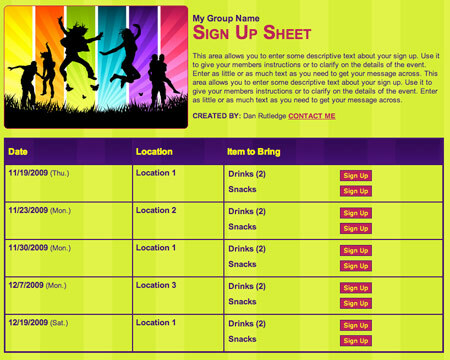 Organize a youth night out!